As an instructor, you can request that portfolios be submitted as subject assignments. The normal process is followed to set up your Blackboard assignment but you will need to specify a setting in the Submission Details area. Follow the steps below to set up an assignment based upon a portfolio. On the action bar, point to Assessments and click Assignment. On the Create Assignment page, provide the name, instructions, and any files students need. Optionally, select a Due Date. In the Grading section, type the Points Possible and optionally, associate a rubric. Under Submission Details you will find the place to select the portfolio assignment type. Note: You usually do not need to specify a template here. If you have set up a template for students to use this will normally have occurred before you set your assignment up and your assignment instructions will convey this. You want students to submit work they have already created. Choosing Select Portfolio Template will give students a brand new version of the template – not the work in progress. Optionally, expand the sections to make selections such as anonymous grading and how the grade is displayed. To learn more, see Assignment Grade Settings. Select the Display After and Display Until check boxes to enable the date and time selections. Display restrictions do not affect availability, only when the assignment appears. Optionally, select the check box to Track Number of Views. 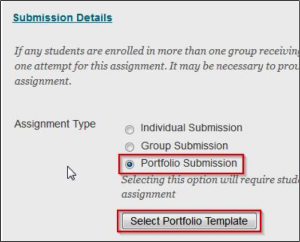 Note: Portfolio snapshot submissions made through an assignment are not listed in the student’s list of shared portfolio snapshots and cannot be rescinded like other sharing events. 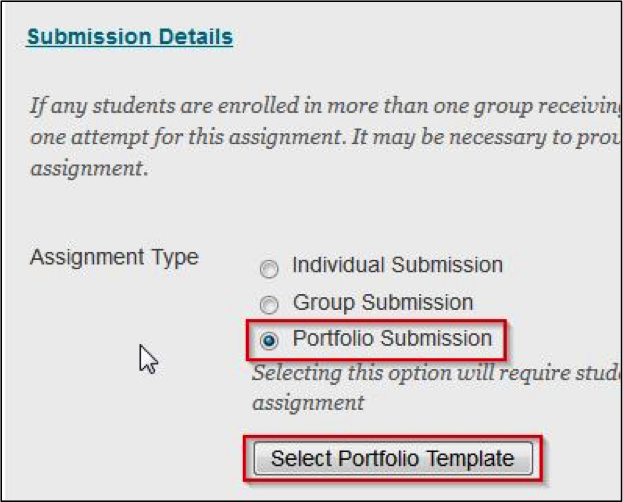 When a student has submitted a portfolio in response to an assignment, the portfolio is viewable in the assignment grading interface. The portfolio snapshot is not rendered through Crocodoc, so direct annotation of the portfolio pages is not possible. Grading feedback, rubric results, and rubric feedback provided in the grading sidebar is separate from portfolio comments. This information is stored independently as part of the assignment attempt—not as part of the portfolio or portfolio snapshot itself. From the grading sidebar, you can download a portfolio as a ZIP package of HTML files. You can also set up and mark with a rubric as for the normal Blackboard assignment.